Drones: Innovation or Public Safety Menace? Posted by Shelley Grell on September 9th, 2016. In recent years, drone innovation has been accelerating at such an exponential rate that regulations have struggled to keep up. The capabilities of this technology is limitless – from the positives such as: filming athletes in a race; delivering medicines to remote places; mapping terrains; or checking the condition of a bridge – to the negatives such as: spying over private property; sneaking drugs or electronics into a prison; or risking lives by flying dangerously close to airplanes. Many of these innovations are already providing amazing scientific, economic, and social benefits. But if standards and guidelines are ignored, or if the technology gets in the hands of those who want to cause harm, will the rules be enough to protect ourselves with confidence? Ethical, privacy and safety breaches are providing strong reason for society to be concerned about the vulnerabilities. Already in New Zealand there are 2645 registered drone users, 968 commercial drone operators, and 400 registered drone companies. In the US, the commercial drone industry is burgeoning, with researchers predicting it will generate more than USD$82 billion for the U.S. economy by 2025. A report on “beyond-line-of-site” drones (also called Unmanned Aerial Vehicles or UAV, and Unmanned Aircraft Systems or UAS), estimates that drones will benefit New Zealand by up to NZD$190 million per year across just three sectors studied – if we can get the regulatory environment and technology right. The questions are, will the risks outweigh the advantages of drone technology, and do we have sufficient capability and resource to manage infringements? Originally used for target practice by the Royal Marines in the 1930’s and 1940’s, drones today are commercially available on a large and increasing scale. For a few years now, they have been helping a number of government, research and industry organisations to gain access to new and valuable data more easily, quickly and efficiently than ever before. There is still huge potential of this new technology to be explored. And, with our vast multi-level terrain, multiple climates, weather conditions, and low population, New Zealand is one the world’s most active hot beds of drone development. What might have been considered science fiction just a couple years ago, is fast becoming a reality today. For example, in agriculture, farmers are already using drones to monitor their stock and pasture cover remotely – saving them considerable time and fuel. The average small drone can be launched within minutes and fly over a range of five miles for up to 90 minutes. They can also be fitted with other technology, like high ­resolution infrared cameras that can zero in on suspected criminals, wildlife, poachers, missing people, or monitor events, and more. Drones are also being used to help with emergency response and disaster recovery, improving security, helping with pest control and erosive monitoring. There are even trials underway to discover if drones can be used safely for delivering freight direct to the buyer’s door, transporting medicines, and more. Even in the GIS industry, a low altitude small drone could provide surveyors and GIS professionals with a more cost-efficient alternative to the georeferenced photographs taken by manned aircraft or satellites. More so if the drone is kitted with LiDAR and camera equipment to create a turnkey remotely piloted flying LiDAR scanner that can capture rich and accurate images more frequently and cheaply. In fact, GIS is predicted to be the second biggest commercial drone market behind aerial photography and cinema, and ahead of precision agriculture. 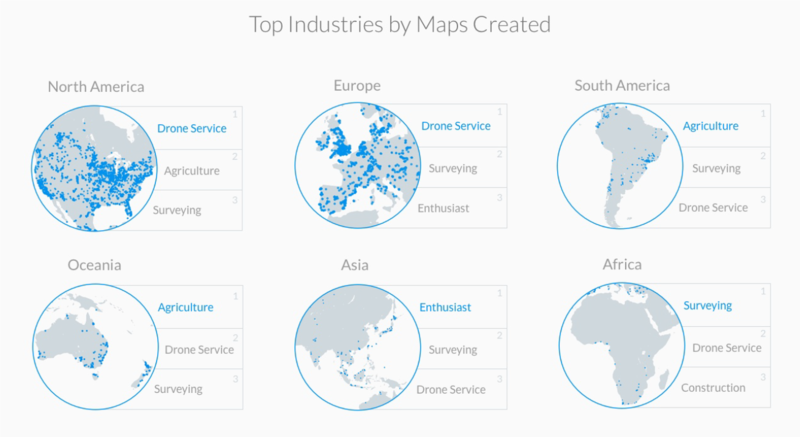 Image: Top commercial drone industry trends based on DroneDeploy usage data. One example of this is the research team at Auckland University’s School of Science which specialises in unmanned aerial low altitude sensing and geospatial analysis for ecological and environmental monitoring. Using a swarm of flying drones, the AUT UAV team is creating high resolution maps of habitats and landscapes, monitoring wildlife behaviour, and examining the human impact on the environment. They are also working with a Swiss company to create 3D mosaic landscapes and turning the images into a virtual reality experience. This allows people to visualise and understand their environment in a way they’ve never experienced before. Disruptive innovation, or a potentially catastrophic disruption? Because drones can dramatically lower the cost of data collection and analysis, the pace of development has been phenomenal. The challenge for policy makers however has ranged from determining how to protect public safety and personal rights, such as privacy and land ownership, as well as areas of national, historical, or natural importance from potential harm caused by drones – either intentional or accidental. It was only last year when the Civil Aviation Authority in New Zealand announced new rules to improve aviation safety for drone operators, other airspace users, and for the general public and their property – eight years after the first known incident was reported in the country. And it was just last month that the White House Office of Science and Technology Policy in the US announced new steps to promote the safe integration and innovative adoption of drones across the country. While the rules may prescribe more explicit constraints upon the use of drones than was previously the case, understanding and abiding by them is another matter. And as more and more drones enter the market, understanding and enforcing compliance will be challenging for both users and the authorities. For example, Amazon and Google’s drone package delivery plans have already hit a stumbling block with the new US regulations. By 2018 there will be an integration of airspace in New Zealand, where drones will be part of the transport grid. With increasing drones in our skies, the next challenge will be innovating a way to manage the airspace and avoid collision. Meanwhile, the race is on with innovation in drone technology happening at warp speed around the world, and everyone is joining in from hobbyists to global brands. 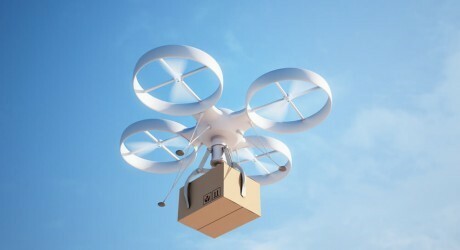 Amazon has been trialling its Prime Air drone delivery service in the UK, Dominos has been working on various air and land based drones to deliver pizzas, and last but by no means least Facebook is now racing against Google to deliver 5G to unconnected parts of the world with its solar powered Aquila drone that can fly for months. To ensure their economies don’t miss out on a slice of the lucrative drone pie, governments are providing incentives for innovators to research, develop and commercialise drone technology. Last month the US announced USD$35m in research funding for the National Science Foundation to accelerate the understanding of how to intelligently and effectively design, control, and apply drones to beneficial applications – such as monitoring and inspection of physical infrastructure, smart disaster response, agricultural monitoring, the study of severe storms, and more. 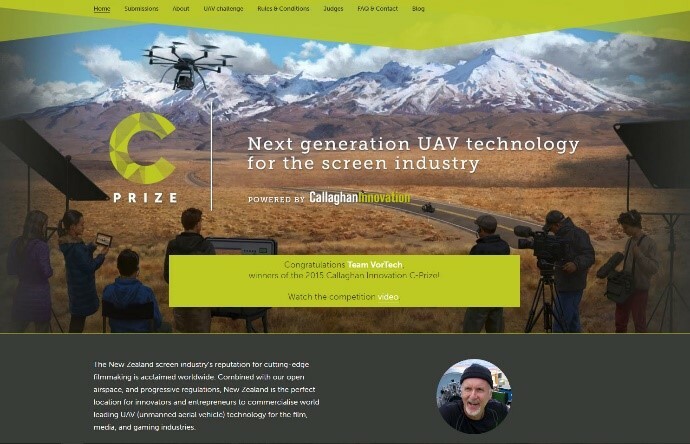 Last year Callaghan Innovation in New Zealand launched the first C-PRIZE & UAV challenge – a NZD$50,000 incentivised challenge that aims to advance the commercialisation of innovative drone technology for the screen industry. Team VorTech won the prize for their Gyroscope UAV that uses an innovative propeller design that allows thrust in any direction, helping it hold position in gusty winds. Like other countries in this drone innovation race, New Zealand has been ploughing funding into firms like Aeronavics to ensure the pace of research and development stays lightning fast. If users can work around and abide by the new rules and regulations, then the future looks bright for both the drone industry and for society. But if rules and resources fail to protect your personal safety and privacy, what would you do to protect your rights?